From personal experience, I can say that Spotify is the best music streaming platform on the face of this Earth. Period. But, the company has now been bulking up on features, as well as original content, to compete against its arch-rival Apple Music and prepare for the upcoming IPO. Falling in line with the same, Spotify has today introduced a new “multimedia format” that will complement your listening experience. This will help improve the existing experience of podcasts, audiobooks, news and other content with visual cues, apart from the music you hear on the regular. Spotify says Spotlight adds something extra in the form of visual elements such as text, still and moving images, or videos. It would be able to present you with more context and deeper insight into your favorite artists, books, playlists or publishers. And if you’re thinking that Spotify already has a feature named Spotlight, well, that’s quite different than this one. It also involves playlists and music, but focuses on highlighting the up and coming artists in the industry. The new Spotlight, on the other hand, adds up to the new visual format that’ll enhance your listening experience. 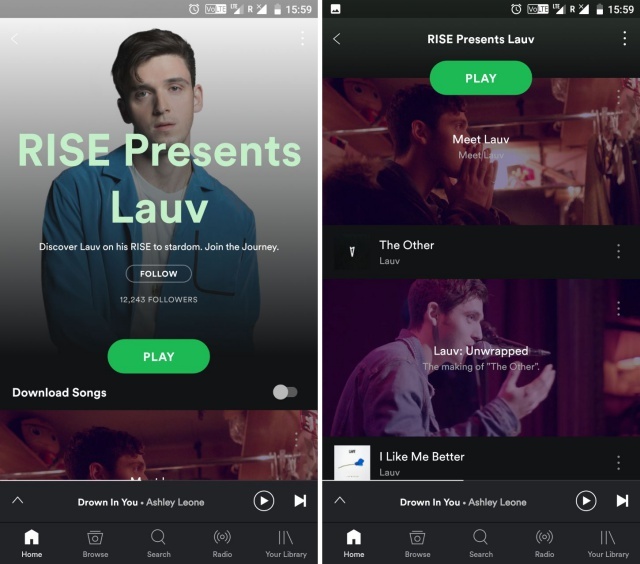 This new format can be seen as the latest addition to Spotify’s original content plans, which will eventually help them outrun the competitors. Apple has recently also been directing its attention to the production of original video content, with two TV shows out of the door and available for streaming on Apple Music. The new Spotlight feature has already gone live in the United States, with plans for rollout to additional markets “in the near future”. The programming for the same is currently spanning across categories such as news, pop culture, sports, politics and other voices available on the platform. So, are you ready to try out Spotlight? Tell us your opinion of it in the comments below.